Flatirons Digital Hub is a core application within our clinical archiving solution. It is the user interface to OpenText™ InfoArchive―a central repository for legacy EHR data―for viewing and exporting historical patient data. Clinicians and HIM staff use Flatirons Digital Hub to execute granular searches of archived EHR information by encounter, provider, medication, and other criteria. It sits as a link in your current Epic, Cerner, or other EHR interface, giving users immediate access to the archive within your production system. By easily serving patient data, compiling selected records on-the-fly, and providing insights into efficacy of care and patient outcomes, Flatirons Digital Hub elevates the value of your legacy data to improve outcomes. By helping users quickly find historical patient data within your clinical archive, Flatirons Digital Hub enables clinicians, HIM users, compliance teams, and finance departments to improve patient care, respond quickly to release of information requests (ROIs), improve outcomes for litigation events, and improve financial performance. Flatirons Digital Hub uses a data model for organizing patient records in InfoArchive and adds logic to the retrieval of data from the repository. This makes it easy for clinicians and HIM staff to quickly search for and find the specific information they need. 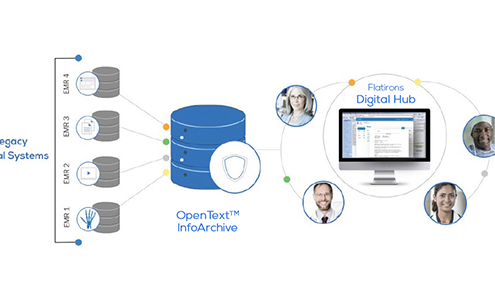 Unlike other healthcare archiving solutions that limit users to standard, out-of-the-box search and retrieval, Flatirons Digital Hub is customizable, giving you the flexibility to deploy a clinical archive that meets your organization’s usability requirements. Improve quality of care by easily finding historical patient records for a comprehensive patient view. Quickly respond to requests of information (ROIs) and audits (Joint Commission, RAC, CERT, etc.). Avoid financial penalties for RAC audit failures and improve outcomes for litigation events. Monitor and update your Accounts Receivable burndown after legacy systems have been decommissioned. Contact us to learn more about Flatirons Digital Hub – Healthcare Edition.